Earlier this year, we launched our latest suite of Global Digital Reports - a full digest of which can be found here. Now, as part of our deep-dive series, Communications Manager Ryan Dubras examines how we in the UK are spending our time online; and the trends brands need to be aware of when it comes to capturing audience attention. In 2018, global internet users grew at a rate of more than 11 new users per second. That’s an impressive one million new users every day. In the UK, 95 per cent of the total population now has access to the internet - that’s 63.43 million people - and the average time spent using the internet on any device each day in Britain is now 5 hours and 46 minutes. However, it’s not just who has access to the internet, but where and when they are accessing it which is changing; the ways in which we use the internet is rapidly evolving too. So what are these 63.43 million connected Brits doing online for all that time? 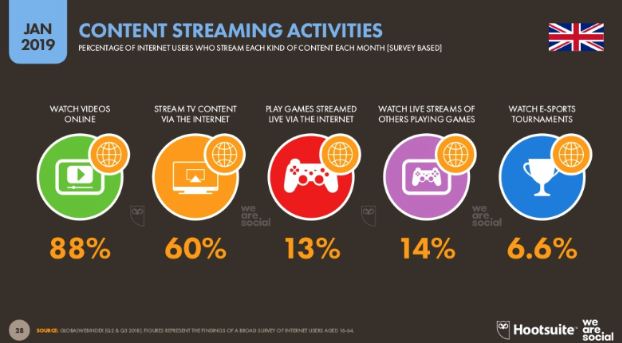 Streaming TV content is now one of the most popular ways we Brits spend our time online. 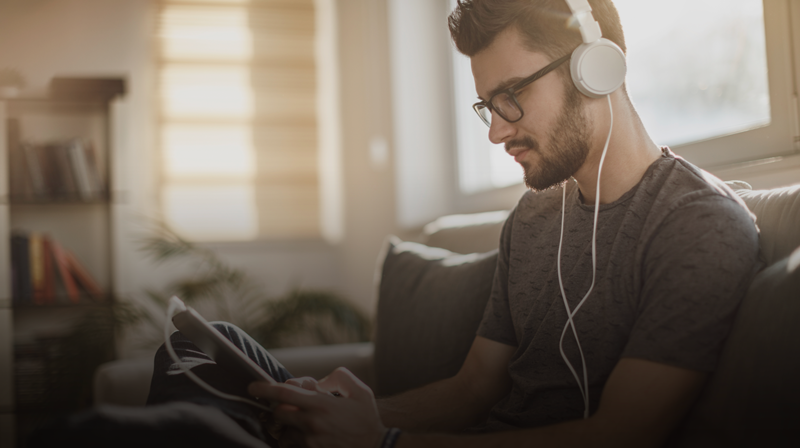 60 percent of us now stream TV content online each month, up from 47 per cent in 2017. This is followed by time spent watching live streams of others playing video games online (14 percent of people), narrowly beating actually playing games ourselves (13 per cent), and then finally, watching e-Sports tournaments comes in at 6.6 percent of people. Considering the growth of live streaming video platform, Twitch, over the past year - with 12 percent of internet users in the UK now saying they actively use the platform - it makes sense to see a rise in popularity of people viewing gaming content. In the UK this year, the Premier League even announced its inaugural ePremier League event to tap into this growing trend; which spurred many clubs, including Chelsea FC (with our help), to go on the hunt for gaming talent that could represent them at a national level. The most popular way we spend our time online, however, remains streaming videos, which 88 percent of us now say we do regularly each month. My money is on cat videos. 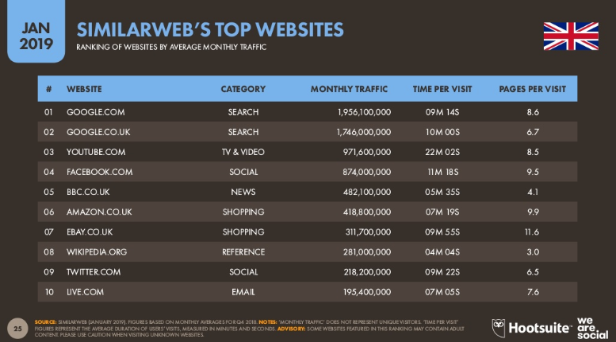 As you might expect, Google continues to dominate the rankings of the UK’s most visited websites, with both SimilarWeb and Alexa (Amazon’s analytics arm, not the digital assistant) putting the search giant at the top of their tables. Given that 88 percent of us Brits spend our time online streaming videos, it’s also not surprising to see YouTube coming in a close second behind the search giant. Interestingly, last year YouTube actually overtook fellow online giant Facebook in SimilarWeb’s UK rankings, gaining nearly one million more monthly visits than the social media network and boasting twice as much time spent on the platform per visit. Time spent on YouTube per visit in the UK also increased from 20 minutes and 8 seconds in 2017 to 22 minutes and 2 seconds in 2018, while Facebook, on the other hand, saw a decline from 12 minutes and 1 second to 11 minutes and 18 seconds in the same time period. Despite the overall decrease in the UK in time being spent on social media platforms last year - dropping from 1 hour 54 minutes in 2017 to 1 hour 50 in 2018 - according to Amazon's analytics tool Alexa, social networks still make up 6 of the top 20 most visited websites in the UK. 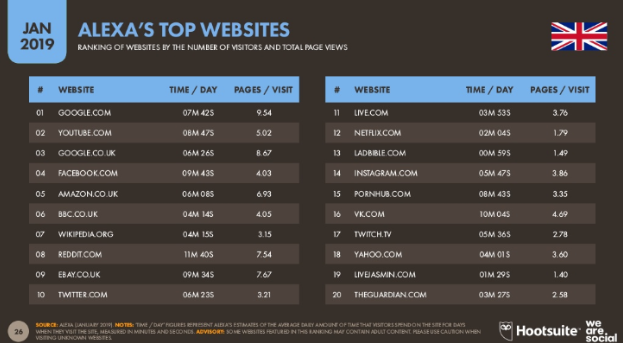 YouTube, Facebook and Reddit ranked the most visited of the bunch. As well as the type of content we’re spending our time viewing online, the ways in which people ‘interface’ with the internet are changing too. The use of voice control tools increased significantly during 2018, with roughly one in four internet users in the UK now using voice search/commands every month. Interestingly, however, when compared to global users the UK is still lagging behind in terms of the adoption of voice search technology. An estimated four in every ten internet users around the world now use voice search each month, with India leading the charge with a staggering 51 percent of internet users searching this way. The UK is far surpassing Japan and the Netherlands, however, where only 15 and 13 percent of the population, respectively, currently use voice as a method of searching for content online. Over the next 12 months, voice control will increase in importance. As global platforms and tech giants like Apple, Google, Facebook and Amazon continue to develop increasingly user-friendly interfaces that are driven by voice commands - largely to serve less literate new users in emerging markets - we could see a revolutionary change in the way people interact with content and devices. It’ll be important for brands to ensure their search marketing and content strategies are optimised for a voice-first world to ensure they don’t get overlooked. Video content is also set to lead the way in continuing to grab audience attention online. Whether it’s branded content on YouTube—player generated content or live e-Sports events on Twitch—or short-form clips on TikTok; brands and marketers should be starting to consider where their audience is spending their time, what content they’re most interested in, and where their opportunities are to get involved. If you’re unsure about the right time to start considering the jump to a new platform, our Senior Strategist Zanna Wharfe has shared some insights into this very topic with Creative Review, which you can check out here. 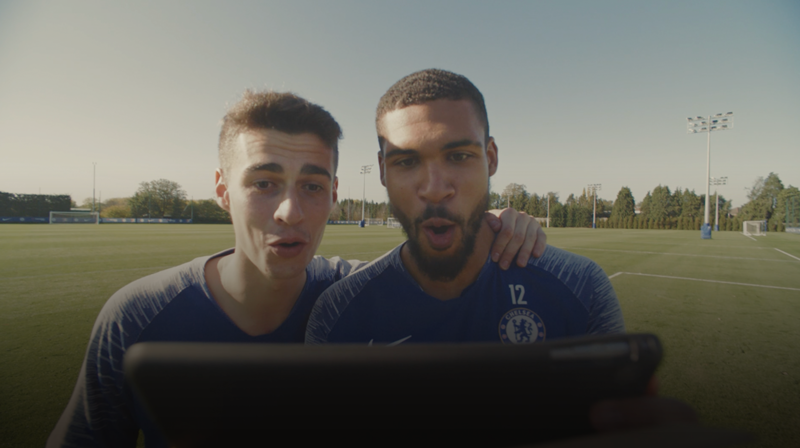 We helped Chelsea FC harness the power of social media to seek out gaming talent to represent them in the ePremier League.